Everything you ever wanted to know about Dry Ice!! WE DO NOT DELIVER DRY ICE. DRY ICE is - Compressed Carbon Dioxide (CO2 Gas). It is 110 degrees below zero. It will freeze anything it comes in contact with. DRY ICE Do's and Do Not's! -DO NOT Expose bare skin to DRY ICE. Frostbite will occur. Handle with tongs, a towel, oven mitts, etc... NEVER use dishwashing gloves. -DO NOT Eat DRY ICE. See directions below for WITCHES BREW/PUNCH that will be consumed. -DO NOT Leave children or pets unattended with DRY ICE. -DO NOT Put in stoppered container; Anything with a vaccum seal (i.e. Soda bottle; Thermos). DRY ICE is a compressed gas and WILL exploded if stoppered. -DO NOT Put DRY ICE into fine china, crystal or metal containers. DRY ICE will freeze and break china and crystal. When DRY ICE comes into contact with metal surfaces, it makes a high pitched screaming/squeaking sound, almost like fingernails on a chalkboard!! DO NOT put DRY ICE on a ceramic tile countertop. DRY ICE can crack the tile. - DO NOT store in refrigerator/freezer. Air flow makes DRY ICE dissipate faster. It IS ok to store DRY ICE in your refrigerator/freezer if it is not working and you are using it to keep your food cold/frozen until it is repaired/power is restored. - STORE/TRANSPORT in a cooler/ice chest. If you area traveling small distances (i.e. picking up the DRY ICE and taking it home/to school to use immediately or store once you arrive) an ice chest/cooler isn't totally necessary. Any excess air space left in the cooler/ice chest, fill with towels, blankets, newspaper, etc... If possible cover the cooler/ice chest with a blanket and leave it in a place where little air movement will occur. - FOR BEST RESULTS with WITCHES BREW/PUNCH that will be consumed, break the DRY ICE into small pieces and then put it into a piece of cheese cloth or a NEW knee high stocking. This keeps small flakes of DRY ICE from floating around and accidentally being consumed. - ROOT BEER & OTHER BEVERAGES: This is a fun party activity for children of all ages! You will need: A large container, 1 gallon of water, 2 cups sugar, 1 oz. Root Beer extract (or your favorite flavor) and about 2 lbs. of DRY ICE. Pour the water into the large container. Stir in the 2 cups of sugar and the extract. Continue to stir until the sugar has completely dissolved. Break up the DRY ICE into small pieces and put them in the mixture. The beverage will be ready to drink once the DRY ICE has dissipated. - "FOOD GRADE" DRY ICE: So called "Food Grade" DRY ICE does not exist. DRY ICE is simply DRY ICE. Putting DRY ICE in punch/witches brew is safe if the above guidelines are followed. Unfortunately in recent years, TV personalities have coined this false phrase. High end grocery stores have have used this to their advantage and begun carrying DRY ICE (from the same manufacturers that we purchase from!) and calling it "Food Grade" so they can charge 2-3 times as much. - FOR BEST RESULTS with 'FOG,' use hot water and a heating element. Get an electric pan/crock pot that will keep the water hot. Break your DRY ICE into small, silver dollar sized chunks and put them in the water as needed. The heating element saves time, in that it keeps the water warm. You won't have to keep changing the water every few minutes. If an electric pan/crock pot is not available, DRY ICE will still work. As before, Hot water is best, but you will need to change the water frequently as the DRY ICE cools it down quickly. In both cases breaking the DRY ICE into small, Silver Dollar sized pieces IS important. It contributes to the 'fog life' of your DRY ICE. If you put too big of a piece into the water, it will form an ice ball around itself and the 'fog' effect stops. - DRY ICE vs. 'Fog Juice'/Fog Machines: Fog machines that use 'Fog Juice,' use propylene glycol and triethylene glycol mixed with water to create fog. While no long term studies have been done to see what affect these chemicals have on peoples lungs, they do seem to affect people with breathing conditions such as asthma. (This webmester has personal experience with having asthma as a child/young adult and being around fog machines in nightclubs/concerts/halloween events is not always a pleasant thing.) On the other hand, Dry Ice emits carbon dioxide, which is a normal part of our atmosphere and we expel it every time we exhale. As stated above though, careful consideration must be taken to insure that you are using DRY ICE (as well as Fog Machines) in a well ventilated area, as suffocation can occur if you are working in a small space with no fresh air; i.e. open windows/doors. - BUBBLES: This is a simple twist on the FOG method. Add your hot water and DRY ICE to your cauldron/crock pot. Then add 1 tablespoon of dish washing soap. (More depending on the size of your container) When the 'FOG' rises from the cauldron/crock pot, it will come out in BUBBLES that when popped, will release little 'poofs' of FOG. Add your favorite color of food coloring for a special effect. - BUBBLES 2: You will need, 2 bowls, one large and one small, dish washing soap and a small strip of cloth. Fill the large bowl with hot water, the small bowl, half full, with cold and soap. Put some dishwashing soap on your fingers and run them along the rim of the large bowl. Soak the cloth in the small bowl until it is completely covered in soapy water. Make several passes over the large bowl - be sure you are touching the rim with the cloth - and a bubble should form. 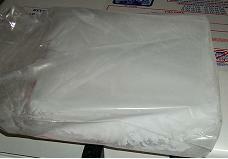 - SHIPPING: When using DRY ICE for shipping purposes, check with your carrier (i.e. UPS, Fed Ex, etc...) to see if they have any special requirements. When traveling (i.e flying, train, bus, etc...) with DRY ICE, contact the the airline/travel provider to see what their policies are with DRY ICE and let them know AHEAD OF TIME you are going to have a package containing DRY ICE. This lets them determine where to store your package. Failing to do so is a Federal Crime. 1 slice (between 5-10 lbs) will last (for shipping purposes) about 12-18 hours. - FREEZING: If you are using DRY ICE to keep things frozen, please keep in mind that Dry Ice is 110 degrees below zero. If the food/items you are trying to keep frozen are not all ready frozen, it can cause freezer burn and damage the food/items. If they are frozen all ready, the Dry Ice will cause no damage, it will just give it a deeper freeze and will take a little longer to thaw out. If you are freezing animals for food, trophies or hides, DO NOT let the animal come in contact with the DRY ICE. Surface freezer burn damage can occur. - COOLING: We suggest that if you only want to keep things cold, that you put a barrier of 'WET' ICE between the DRY ICE and the items you are trying to keep cold. Achieve this by putting the DRY ICE on the bottom of your ice chest. Put a medium-thick layer of 'WET' ICE on top of the DRY ICE. Put the items you wish to keep cool on top of the 'WET' ICE. DO NOT allow cans (i.e. soda, beer, food, etc...) to come in contact with the DRY ICE - they'll explode!! - VEHICLE DENTS: Small dents only...Apply DRY ICE to the center of dent. Dent should pop out after a few minutes, but if not, it may take repeated uses, but wait about 5 minutes between sessions. - OTHER USES: Meat processing and shipping, Shrink fitting, Low temperature testing, Science experiments, Carbonation, Water well treatment, Mosquito repellant, Inerting and purging, Deflashing molded rubber/plastic, Industrial cleaning, Freeze branding, Rodent eradication and Removing chewing gum from hair. - DISPOSAL: Carbon Dioxide is a natural part of our atmosphere. Place the DRY ICE outside or in a place with plenty of ventilation. Unwrap the unused portion of the DRY ICE and allow it to dissipate. Q: Can I use DRY ICE in a substance that is to be consumed? A: Yes. As long as you follow the above stated guidelines, its perfectly safe. DRY ICE is Carbon Dioxide, the same stuff they use to carbonate soda. Q: I want to put DRY ICE in my pumpkin, can I do that? A: Yes. Simply follow the DRY ICE FOG tips, or just put a piece of DRY ICE in the pumpkin and let it naturally dissipate. It will make your pumpkin a little soggy because of the moisture it releases. Q: I am undergoing chemotherapy treatment for cancer and need DRY ICE for my "cool caps," can I purchase it from you? A: Yes! The "cool caps" are filled with gel that is cooled with DRY ICE. Depending on how many caps you have, you will need about 10-20lbs (approx. 2 slices) of DRY ICE. Q: My pet has passed away and I can't get them to the vet right away to have their remains cremated, can I use DRY ICE to keep them preserved until then? A: Yes. What you want to do is wrap your pet in a blanket or towel. If it is a small pet, you can place the DRY ICE on top of their remains. In the case of a large pet, we suggest placing DRY ICE beneath them as well as above them. Then place another towel or blanket over the DRY ICE to keep the air away from it. Put your pet, if possible, in an ice chest/cardboard box, or in a place that they won't be disturbed. Q: My family member has passed away and we are having a home funeral, can I purchase DRY ICE for this purpose? A: Yes. For an average person, you will need approx. 40-80 lbs of DRY ICE to keep the body cool for about 72 hours. This is an estimate and you made need more depending on body size and ambient temperature. Place the DRY ICE under the body, and in the case of a larger individual, place a bit on top as well. Keep the room the deceased is placed in well ventilated when using the DRY ICE. The French chemist, Thilorier discovered DRY ICE in 1834/5 (depending on what you read). In 1932 it was estimated that 120,000,000 lbs. of DRY ICE was being manufactured in the United States. Disneyland manufactures its own DRY ICE. The first commercial use of DRY ICE in the United States was in 1925 for fire extinguishers. In 1924 Thomas Slate applied for a US patent to sell DRY ICE commercially. He then became the first to turn DRY ICE into an industry. In the UK it is sometimes refered to as "Card Ice" due to the registered trademark of "Cardice" by Air Liquide UK Ltd.
DRY ICE can be used to protect grain/grain prodcuts from insect infestation by displacing the oxygen but not altering the taste/freshness of the product. Scientists following the Mariner 4 spacecraft in 1966 concluded that Mars' poles were made entirely of DRY ICE. Our minimum purchase of DRY ICE is one slice. DRY ICE slices are approx. 5 - 10 lbs and measure approx. 8 in. X 8 in. X 1-2 in. thick. Because DRY ICE starts to dissipate once it is made and there is no way to stop it from dissipating, it comes to us in varying weights. We DO NOT carry pellets. DRY ICE is a hazardous material (Compressed Carbon Dioxide-CO2 Gas). You must be 18 years or older to purchase. * We are available 24/7, 365 for opening or delivery (Wet Ice ONLY) for a fee. 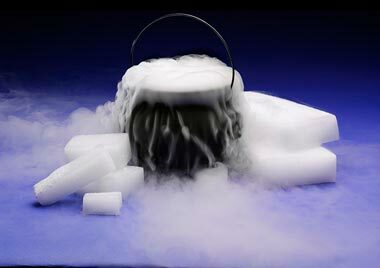 We DO NOT deliver DRY ICE, but will open up for you to come purchase it.